Dr. Lueck received his degree from the University of Minnesota and has practiced and owned Companion Pet Clinic of Aloha since 1992. Dr. Lueck received his degree from the University of Minnesota. He has practiced and owned Companion Pet Clinic of Aloha since 1992. Barry’s special interests include dermatology and canine and feline sports medicine. 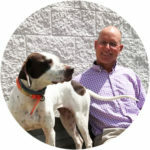 In his leisure time, Barry enjoys bird dogs, mountain biking, and family activities.